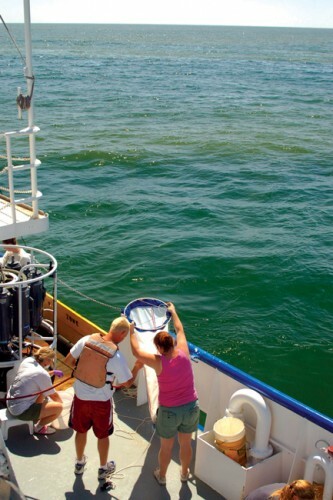 NOAA has recently been funded to explore the role that nutrients, both natural and man-made, play in the development and duration of red tide blooms. The diverse research team has over 125 combined years of K.brevis research experience and will focus on identifying nutrient sources, measuring the impact of the sources and identifying regulatory alternatives. Part of the funding will be used, in conjunction with the State of Florida, to continue the important red tide monitoring efforts that are already in place and to increase the use of new technologies such as remote water quality detectors with 24-hour-a-day web reporting capabilities. Over the years, scientists have learned a great deal about red tide and its effect on human beings and the environment. They have learned that a red tide bloom is not just a cluster of K. brevis cells, but it is a living biomass of a variety of interacting organisms. Some of them like Tricodesium, a nitrogen-fixing microorganism, are a prey species or a nutrient source for K. brevis. 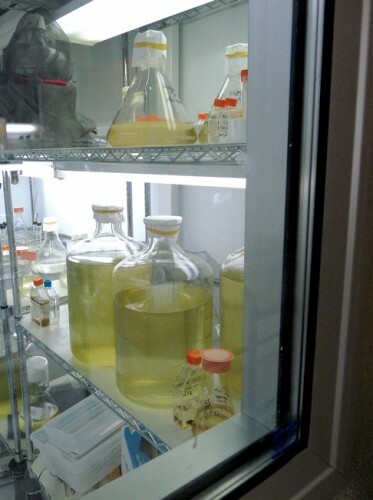 Other organisms like diatoms, a single-cell algae, are not a food source for K. brevis. Still other organisms like Skeletonema costatum, a competitive phytoplankton, are capable of surviving red tide , by detoxifying the toxins in the water column. And finally, there is at least one organism, amoebophrya, a parasitic dinoflagellate that infests and kills other dinoflagellate hosts, that appears to prey on K. brevis cells. The interaction of these various organisms may play a role in the eventual dispersal of red tide blooms as the mix of food sources, toxin absorption and competitive prey species evolves within the bloom. To further explore these natural phenomena as possible controls for future red tide blooms, the Florida Fish and Wildlife Commission’s Fish and Wildlife Research Institute and START established the Red Tide Control and Mitigation Program in 2007. Between 2007 and 2009, the program funded twelve studies addressing a number of topics including red tide’s effect on human health and biological, chemical or physical control of red tide blooms and their toxins. Under the direction of Jerome Naar, scientists pre-treated clams with cysteine, an amino acid that naturally occurs in the Gulf of Mexico, prior to their exposure to a red tide bloom. The treated clams accumulated less than half as much brevetoxin than the untreated clams in the control group. Used as a preventative measure to treat clams removed from their beds before a bloom arrives, this process offers the possibility of an effective preventative program without the chance of an unforeseen negative environmental impact. Julia Kubanek has successfully used Skeletonema costatum, a phytoplankton native to the Gulf of Mexico, to reduce toxicity in waters infested with red tide. Her work demonstrates that proteins released by the organism detoxify red tide’s brevetoxins. This finding could lead to developing an enzyme-based additive or a protein-absorbent resin to remove waterborne toxins. Large amounts of silica naturally flow into the Gulf of Mexico from Florida’s rivers every year. Through his research efforts, Jason Lenes has learned that areas in the Gulf with high amounts of silica are populated with diatoms, a non-food source for K. brevis. As the diatom population increases, it tends to crowd out Trichodesmium, a main nutrient source for red tide. This work could lead to ways of changing the nutrient mix that could shorten the length of red tide blooms. Funding for the continuation of these promising studies has unfortunately been eliminated due to cuts in Florida’s budget. START will continue to work with the State’s policy makers in Tallahassee to try and find funding to turn these studies into workable tools to control the effects of future red tide blooms. If you want to learn more about what you can do to reach the State policy makers from your area, contact START Florida at 941-966-3400.